Decorative newel caps for softwood and hardwood stairs. 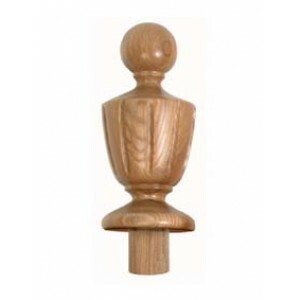 These Grecian style newel caps are an excellent choice for adding the finishing touches to stair newel posts. This particular style will add a touch of classic drama to a new or renovated staircase. The Fernhill Range of stair parts is the ultimate range of stair components, ideal for producing something grand and memorable. These impressive parts are perfect for creating a focal point in a large hallway. The scale of these stair parts gives them a really grand feel. These newel caps will work well with square and turned newel posts, to create a design of stairs that suits your home perfectly.